COGREGS now is not a register, but the plural of the word COGREG and COGREG4 is the fourth COGREG, where the COGREGs form an array of longs in the cog. By convention those registers are used by dedicated words, like WAITPNE, if I understand correctly. prints the actual address of the register in the cog. There is the "@ symbol so COGREG@ is pronounced as COGREG FETCH"
From the kernel source you can see that there are other locations addressable as a fixed COGREG and even before REG0 there are fixed registers for SPI operations too accessed with a negative index. Thinking about that, I may convert them all to a more efficient positive index since a 15-bit unsigned literal can be represented by a single wordcode. So: is REG0 an alias for COGREG0 ? I didn't dare to dive into the kernel, but I fear, I have to do so. Peter - did you mention that EXTEND-V4.FTH leaves a #30404 on the stack when building? The procedure to initialize the LCD is named !LCD to indicate: this is an initialization. Later, PLOT is called without , so does  replace LOADMOD + RUNMOD? @ErNa - whenever we want to RUN a MODule we first load it and by convention all module names are enclosed in [ ] so in the case of the PLOT module we load it with [PLOT] which can now be executed with the RUNMOD opcode, essentially transferring execution to the start address of the module that was loaded. But when reading source code its confusing because the RUNMOD can be running any kind of module that was loaded so to make it read clearer we create an ALIAS of RUNMOD called PLOT. So [PLOT] is part of the kernel and loads the PLOT module into a fixed cog location that can be called by RUNMOD but referenced as PLOT. BTW, V4.2 does away with COGREGs Well, not exactly but I am able to move all these registers to the start of cog memory at location 1. So since all COGREGs are now actually the index + 1 I get rid of the indexing operation and simply refer to the locations 1,2,3 etc and use COG@ and COG! instead. This not only saves memory but is much faster too. V3 had to have these cogregs in upper cog memory since opcodes directly indexed the first 256 longs in cog memory but wordcode addresses all of cog and hub memory. Oh good, I like clean and simple. OMG, I really didn't expect Peter to present us such a mess of COGREGs, indeed, he's the last one I expected it from! In contrast to the situation after Obama. But now, after I got a glimpse of how it works, a clean, neat solution will come to existance. All nonconformal elements will be banned. Peter did whatever he had to in order to get Tachyon the most "performance" from P1. FTP, HTTP, TELNET access while running a user routine and access to a serial console (just in case) has not been matched or even attempted in any other methodology on the P1. Tachyon is only getting better. It will be great see this methodology applied to other chips and eventually P2 silicon. with all those changes I better wait until 5.0 before I reread/relearn the Tachyon source. Great, that there is progress ..
Once Tachyon, ever Tachyon! Fighting to enter into "once"! I see your fighting as struggling with a different way of thinking. When once everything was strict and fixed it was easy to learn and remember, and easy to teach (and mark). However that strict and fixed approach is not so flexible for the job at hand yet isn't the tool made to fit the job and not the job fit the tool? Every "job" is different and it would be nice to have a tool that could be made to fit the job. That's what Tachyon does but of course that makes Tachyon harder to "learn". However if you understand your job, you will understand what tool you need rather than trying to use the one fixed tool. So the tool is adapted to fit the job which is also why Tachyon is not "ANSI Forth" which is rather fixed for working best on PCs, not embedded realtime control over varying CPU architectures. The Propeller is a very different beast to our PC CPUs, and we like it that way. On the forum we see new ones commonly describe a problem by the limits of the solution they envisage. Of course we wouldn't do that would we? But we do something similar when we try to solve problems with fixed tools, in the end we are describing the problem in terms of the limitations of the tool. That must mean that we never see the problem clearly, and never arrive at an optimal solution. To me "less is more", so a simple solution then which shows that we understand the problem. You may have noticed that I try not to refer to sample code when interfacing new chips. One of the reasons is because we start thinking in terms of the limits of the tool and the thinking of whoever wrote that code, and not see what needs to be done or not done. The solution is usually much simpler than portrayed. So I just look at the datasheet and start interacting with these chips at the lower levels, trying different things, testing the limits etc. Once I know that part is working then those new functions become part of the "language" as if the tool is being shaped. Remember that the tool and target application are one and the same unlike a PC compiler and a binary blob. Start at the lower levels and build on that foundation and remember it's not really work, it's play, so have fun! Hi Peter, I like working top down and bottom up, and from a birds view. As every character counts and I try to inhale your coding style, so things are going forward slowly. Hi Peter, I like working top down and bottom up, and from a birds view. As every character counts and I try to inhale your coding style, so things are going slowly forward. LCD diverts character output to the LCD screen using VCHAR rather than the serial console. In Spin the tick is a comment. but here the tick symbol is an immediate operation which reads in the following word and returns with the code field address or run address. In the LCD word we then take that result and write it to the uemit vector which the EMIT primitive uses as a redirection vector. 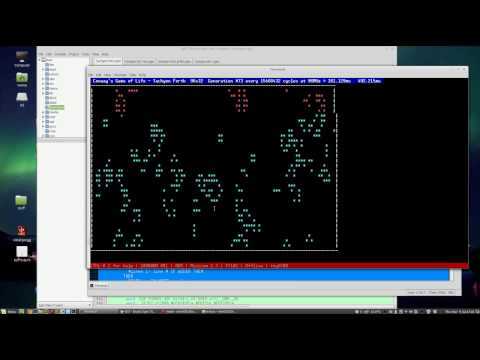 A few years ago I wrote a version of Conway's Game of Life to display on a serial terminal. Here it is again revisited with some extras running under Tachyon V4 of course. One more question: where is LCDBITBLT called? And why not? Or, was that just in response to proplems driver? This code would normally be called from the main program to update the screen but in a games program I would call this from another cog to continually update the LCD screen since the drawing routines only access the graphics buffer in hub RAM, not the LCD directly. Otherwise it is possible to call this routine at the end of the VCHAR routine which draws the font. So you could redefine VCHAR to reference this when it draws a character, and also when it clears the screen. or even simply just call it from the main program but I would rename LCDBITBLT to something more readable then, say DISPLAY for instance. I couldn't resist speeding up and improving the Game of Life, now with a touch of color. So much better that way, don't you think? Yes, it's doing about 15fps on a 64x32 but slows down to 11fps on the 128x32. The screen update is desynchronized from the generation update in this demo but at 64 wide the next generation takes about 77ms, still room fro improvement though. I know this is off topic for this thread but do you know if anyone has done a PASM version of Life that runs on all 8 COGs at once? Or maybe 7 with one driving VGA? In the LIFE demo I treat the universe as a shingle on which to print text using the Propeller font. So I went one step further and made it autoscroll and display when it reaches the right hand side so that it works like a character LCD. Just select the width and make it an output device and all Tachyon character output is directed to the shingle instead of normal character output. Notice the actual text output in the bottom left hand corner. Any idea why I get these three download windows every time I open this thread? I went back to my two post that had youtube links using the youtube forum icon and removed the tags and simply inserted the full https url without any tags and it seems fine. Now if David Betz can edit his post and perhaps remove the youtube tagged link altogether then there should be no more problems. Bump can still get around to removing the youtube tag feature though. Now if David Betz can edit his post and perhaps remove the youtube tagged link altogether then there should be no more problems. Hurray, no more download popups. What is the idea of having I as a loop index, K as a second level loop index and J as a third level loop index? Could you just help, Peter? This is all part of Forth being Forth as we are not assigning a variable for a loop index as we do in other languages perhaps. In Forth the loop index is normally sitting on the return stack along with the loop limit. The word to read that loop index is called "I", so it is a control word, not the name of a variable. In Tachyon however I avoid corrupting the return stack, a sure recipe for disaster in embedded real-time control systems, and so the index and limit values have a special loop stack. One advantage of this is that it becomes a very easy matter to index into this stack from any subroutine called from within the loop. The top loop stack item will always be the current "I", the third loop stack item will be the "I" for the next outside loop, and "J" for the one outside that and so on. There's also another stack in Tachyon that DO LOOP and also FOR NEXT use just for fast branching addresses and that is another "Tachyonistic" way of doing things. Tachyon Stacks: Data, Return, Loop, Branch.